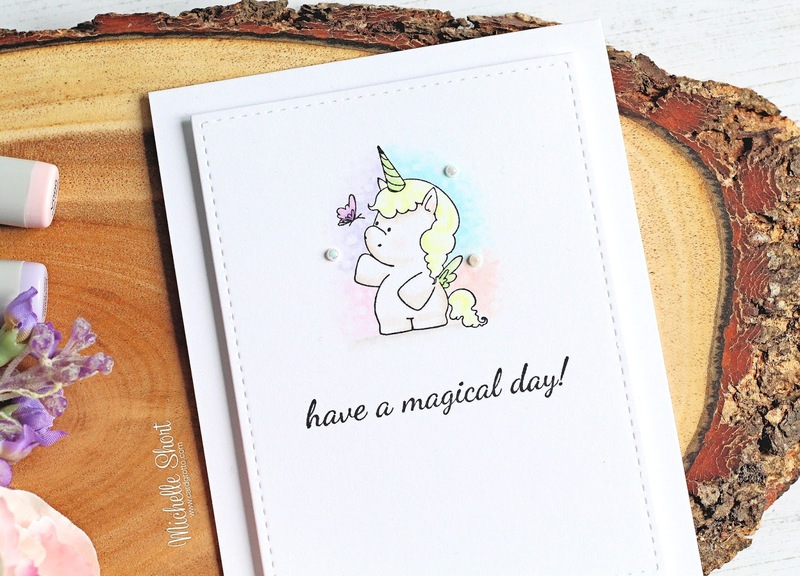 Hello there, today I have my final card to share as part of my guest design Stamping Bella Wonderful Wednesdays With spot. 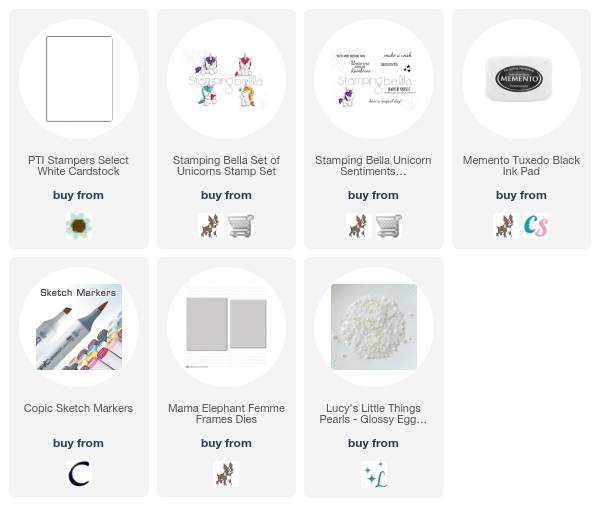 I know I used them two weeks ago, but I couldn't resist using the unicorns again. They are just too adorable! I started off by cutting a panel of white cardstock using the rectangle Mama Elephant Femme Frames die. I then stamped one of the unicorns from the Set of Unicorns. 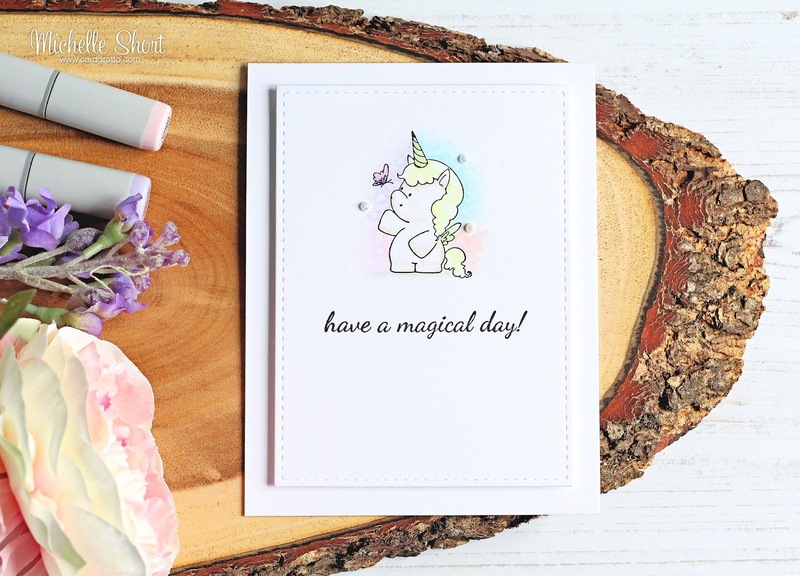 The sentiment is from the Unicorn Sentiments set. I then coloured the unicorn and butterfly with Copic Markers. I added a cloud of colour behind the unicorn using the lightest of the Copic Marker shades in blue, pink-violet, pink-red and purple. It is difficult to see in the photo but I then added dots of colourless blender to add to the magical feel. The panel was adhered to a white A2 card base with foam tape. To finish off, I added clear Wink of Stella to the butterfly and the unicorn's wings. I then added three teeny tiny pearls from Lucy's Glossy Eggshell Mix (they are beautiful!). COPIC MARKERS: Unicorn - E40, E41, Y11, Y00, Y000, YG11, YG40. Ground - W1, W0. Background - B000, B0000, R000, R0000, V000, V0000, BV000, BV0000, 0. For more inspiration please do head over to the Stamping Bella blog. A huge thanks to Em for having me guest again. I have loved it! Thanks so much for visiting me today. I hope you have a great day! Beautifully simple card, little girls would love it.